The final of the first bartlett mitchell ‘Chef of the Year’ competition got me thinking about when I was a young chef. Being competitive I entered as many competitions as possible, ensuring I pushed myself as far as I could. They extremely hard work and nerve racking, and your peers and professionals you admire, scrutinising every detail makes you start to doubt your own abilities. Did I dice that fine enough? Am I filleting this wrong? Is that cooked? Is it too salty? No matter how hard you have worked, or the hours and hours of practice you put in, it can all so easily go wrong on the day. I recall once competing in a ‘Young Chef of the Year’ competition and 45 minutes into my allocated hour I realised that the oven had turned off! Not through any fault of my own, but it was in a dodgy makeshift kitchen, run on portable gas and the gas had simply cut out! When I opened the oven all I found was a melted pithivier and a raw crown of squab pigeon!! There is a photo somewhere of me, which was taken with perfect timing, as I opened the oven door to see the car crash that awaited me! It was not my best look! Thank goodness it was a photo and not a video, as my vocabulary became very short and focused for about 2 minutes. I obviously didn’t win that particular competition, but it was a great learning experience and I can now look back with nothing but good memories. I wanted this competition to be a truly memorable experience for all taking part, whether they won or not. I wanted the chefs to have an experience that would stay with them for the rest of their careers. I also wanted there to be some great prizes for those who are willing take the risk and go outside their comfort zone. So we came up with an amazing winning prize including an all-expenses paid weekend with Adam Byatt and me in Copenhagen, a week’s stage at the Ritz, Mac knife, trophy, jackets, champagne and even a dinner for two at Trinity. It all started with a menu entry. They had to submit a four course menu that would be served to a dinner party of 50 guests. We had nearly 40 entries from teams all over the UK, which was amazing. Adam Byatt and I then had the difficult task of going through them all looking for seasonality, practicality and just a deliciously exciting menu. From this we came up with a shortlist of 12 chefs. The 12 chefs then had to cook a 3 egg omelette, a seasonal salad from a mystery seasonal table of ingredients and the starter from their submitted menu. A pretty full on afternoon! Everyone did themselves proud in this tough heat, which was judged by Adam Byatt, David Steel, Daryll Young and me. The decision was extremely hard as the standard was so high, but we finally came up with our finalists – Luis, Rebecca, Stephen, Dave and Phil. The finale was another step up. The finalists had to cook a Michelin star level recipe given to us by Adam Byatt. As you can appreciate, when you are cooking to this level there is absolutely no room for error, everything has to be spot on! We also brought in another Michelin starred chef, as a guest judge, alongside Adam. Mark Kempson from Kitchen W8 has held a Michelin star for over 6 years. Imagine how our chefs felt having these two culinary powerhouses staring down at their chopping boards going through their prep and determining if their whole salt baked sea bass was on point or under or even worse, over cooked!! I have nothing but praise for these five chefs, they withstood a ridiculous amount of pressure, absorbed it and cooked their hearts out, all with a big smile on their face. The standard of cooking was better than I could have ever hoped for and it was a very close race indeed. The big winner on the night was Dave Hands. You could see that he had been cooking his final dishes over and over to ensure he got them right on the night and his was a well-deserved win. 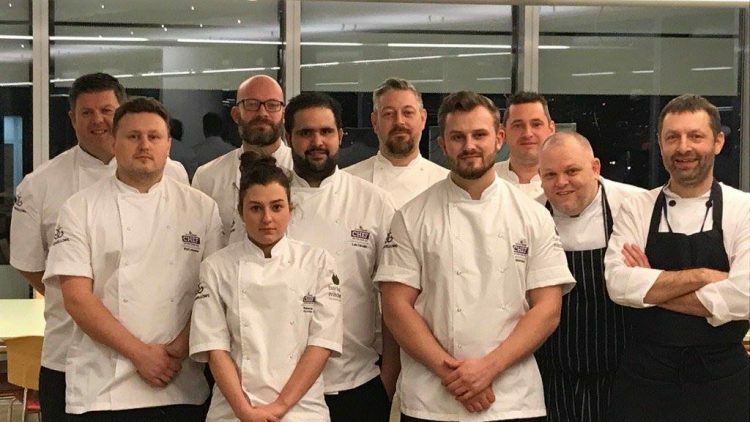 I cannot wait to run this fantastic competition again next year for another crew of ambitious chefs from bartlett mitchell.